Hi there. I’m Miranda Anderson. I’m so happy that you are here listening to Live Free Creative. The podcast today is Episode 22 and we’re going to talk about minimal meal planning. Today’s episode is for those of you who once in a while, or maybe every night, ask yourself the question, what am I supposed to do for dinner? It’s also for those of you who really liked cooking and really like food, but don’t know that you have all of the time in the world to spend on it. It’s also for those of you who don’t like cooking and who don’t have all the time in the world and who really would just like to simplify, take one more decision out of your pocket for the week. 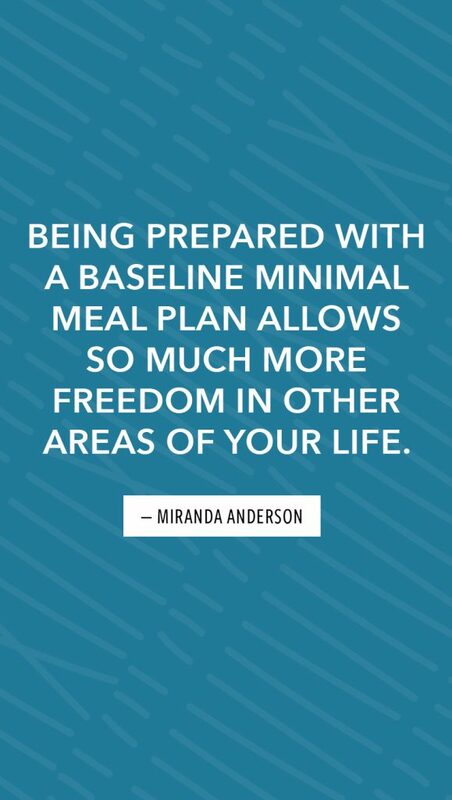 DOWNLOAD YOUR FREE MINIMAL MEAL PLAN WORKSHEET HERE! The other benefit of this minimal meal plan I’m going to discuss is a huge amount of consistency in budgeting for groceries and for food, which is also an incredible byproduct. So that is what we’re going to talk about. Of course I love my segments and it’s been a little while since I talked about life lately. So let me catch you up on what’s been going on and then we will dive into today’s topic. Our life lately has already started looking as exciting as usual. If you have been following along for awhile, you know that our family is no stranger to unexpected kind of out of the ordinary events, the most recent of which was a flood in November that destroyed a lot of our house. During the holidays we were able to move back in and enjoy being at home even just without ceilings in with half a bathroom and with no flooring upstairs. We’ve really liked being home. So that’s a great feeling. However, in order to accomplish all of the remaining repairs for the flood damage, including an update on the master bathroom in the upstairs part of the house, we have had to move out again. I don’t know exactly when we are going to move out right now. We’re still in the house, but I’m hoping by the time it airs that we have moved out because that will mean we will be onto the next phase of the process, which is going to be all of our belongings, furniture and artwork and clothing and everything that we don’t pack into our suitcases to take to the airbnb. All of our belongings are going to be packed and taken to a storage facility. This what the contractor felt was the best option to get everything out of the house. Just because so much of this actual square footage of our house was affected. We live in a 1400 square foot house and about 1200 of the square feet of our house were affected by the flood in one way or another. So, essentially the entire house was affected and they need to repair ceilings with drywall, they need to paint and then at the end of all of that they’re also going to refinish the flooring. So it’s both the ceiling and the floor in ninety percent of the house. The best option was for us to move out. The expected time that will be out of the house is two months, which feels like a very long time with the other things we have going on. Some upcoming fun travel, etc. I am finishing up the first draft of my manuscript for my book and it will go into editing soon. So all of those things are just going to keep us moving forward and hopefully we get that all taken care of soon. In the meantime, the chickens (who I haven’t talked about in a little while) doing so well. In fact their house got an upgrade a couple of weeks ago. We have four hens. Their names are Mozzarella, Goldie Hen, Blackberry, and Feathers. We got them as 15-week-old pullets and knew that they would start laying eggs probably in the springtime when they were old enough and when the daylight hours were long enough. When I initially got the four hens, I ordered a great chicken coop off of Amazon. Here is a link for the cedar chicken coop we have. When I got an and put it together, I was surprised that it was a little bit smaller than I expected. But after talking to a couple of friends who also own chickens, they said, “Oh, if you let them range in the yard during the day, they will be just fine in that hen house and with the couple lay boxes.” So we went with that for a couple months and felt like it really is a great hen house. I really liked the design of it. It was easy to put together. It was not expensive. But, because of the weather where we live, especially during the wintertime. This won’t be an issue in the summer, but there have been lots of rainy, lots of rainy days and also a couple snowy days. In fact, we had a snowstorm in December that took everyone out of school and work for an entire week and of course on rainy days and snowy blizzardy days, the chickens do not want to leave that coop, but they also don’t have a whole lot of covered area to run around. So what I did was order a second coop, the exact same style and I put it together and we just hooked the two coops together! So now, instead of one little chicken run with a hen house and some lay boxes, they have a longer chicken run with two little hen houses and too little a box is it doubled the size of sheltered area that they can run around in. Which was really great and we had these big plans to like build a big chicken run around the little coop and then to put garden boxes all around that. And we still love that idea. We just weren’t getting to executing quick enough and felt like our lady’s needed a little bit more room to stretch their legs on rainy days, so I’ve been super impressed by the way that it is worked out. I’ve also been able to–because now there’s extra space–I was able to also hang their food off of the ground, which is really nice, so basically I feel like we’re about three months into chicken ownership and it has been so fun. They are hilarious to watch. They’re all just getting big and fluffy and they are learning to come to us. When I go outside they’ll run over to me because they know that I’ll give them treats. I give a mealworms and grapes. They are great with my kids. We finally have gotten to a point after a couple minutes of training that our dog is able to have her dog door open so she can run outside and back inside when when the chickens are free ranging in the yard. Having chickens has been a really fun experience. In fact, this is so bizarre, but for whatever reason I feel like these chickens are this manifestation of something that I had wanted in my life for a really long time. The first time I heard about people having that having backyard chicken several years ago, I thought that would be so amazing. I love fresh eggs. I love it. I think I’m like a little bit of a farmer at heart even though I have no idea what that actually would be like and probably I would be terrible at it and I don’t know that that’s really what I want, but I love. I love having the chickens and we thought about it for so long before we actually made it a reality and I’m so happy that we just decided to take the plunge in the fall. It was kind of unusual timing and we just thought that was the best option. We gave each of our kids a for Christmas, so they got their Christmas gift a little bit early. That was our family Christmas gift this year: the chicken coop and the hens. It has been really fun. I have moments where I’m out cleaning the coop or I’m out walking in the yard and I paused and I just look at those chickens and it’s like the symbol to me of the way that I can really create the life that I want. 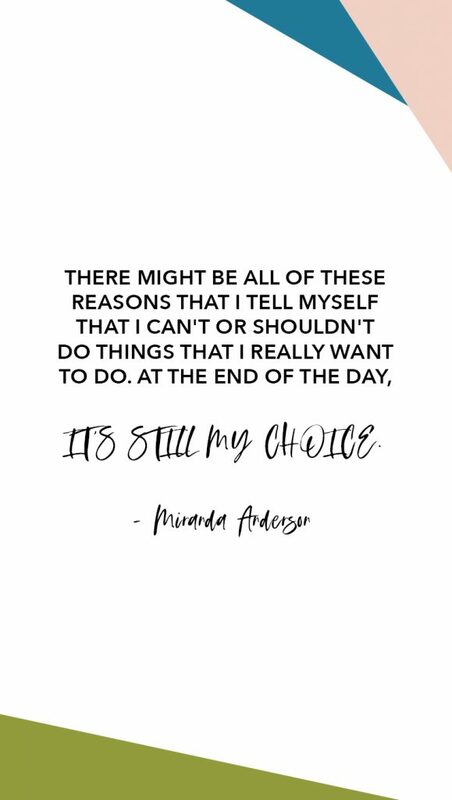 That there might be all of these reasons that I tell myself that I can’t or shouldn’t do things that I really want to do and at the end of the day it’s still my choice. Maybe that sounds silly, but having a backyard full of chickens has helped me feel empowered in living the life of my dreams. That is Life Lately. There are lots of different ways to meal plan. We have done it from A to Z. A few years ago I decided that I need to simplify even further than any of the other meal plans that I had ever done and I created what I called the minimalist meal plan. I’m going to go into more detail in a few minutes about the specifics of what that looks like for our family and how we have implemented it and the results of the implementation in our own lives. I loved to cook as a kid. First, I want to tell a little bit of background. I love to cook and you might not love to cook and that’s okay. We can be different in that way. All growing up I was kind of a free range child and that included in the kitchen. We always had groceries around and when I was hungry I would decide what I wanted to eat and experiment and I would try all different things. I remember one time rubbing chicken with raspberry jam and dijon mustard, which were both things I liked the flavor of and I love the savory sweet and I thought that would be really good together, so I rubbed it all over these frozen chicken tenders that were in the freezer from Costco and put it in the oven and basically made my own little like sweet and sour glazed chicken bites. It was not the prettiest thing in the world, but I remember them being delicious and thinking, “Gosh, this is so fun.” I love being able to experiment in the kitchen. I experimented as an adult. Fast forward to getting married. Because of my love of cooking and some things that I had learned about shopping at Costco, I insisted that we got a Costco membership because that was the only place that I knew how to shop. I grew up in a family with six kids and my parents shopped in bulk for feeding the family. So, Dave and I got our little Costco membership and would go over to Costco and I would buy like five pounds of ground beef and then go home and divide it into Ziploc bags and put it in the freezer so that when I needed it, I had it on hand. I remember one day thinking, “My entire freezer is full of food, but there’s nothing in the fridge. What do people put in their refrigerators?” I had no idea how to actually shop and cook for just the two of us. It took years of figuring that out and experimenting. Also– this is so funny– I was talking to someone the other day and told them about the day that I realized that cookbooks were meant for actually following recipes. Maybe this tells you a little bit about the way that my mom cooks. A little bit of way that I grew up, but I thought cookbooks were like inspirational books. I thought that they were just for ideas and the pictures were really fun so you could get an idea about something you wanted to make. I really was a full blown adult before I realized that if I followed the recipe the way that it was written, that the meal would turn out exactly as the author of the recipe intended. That it seems so silly. It seems so dumb, but I was just a free spirit with my cooking so I would get an idea from a recipe, but I never ever actually followed the recipe exactly the way that it was written. I would substitute things in and I would just kind of do my own thing. I remember thinking cooking is so easy when you have a recipe and you actually follow it. There’s no guesswork. It just works. And what an incredible revelation that was. For me, this was like in my twenties with two kids that I finally realized the way cookbooks are meant to be used. All of that to say I’ve had just my own journey with food and with meals and with cooking as I’m sure you all have as well. In early motherhood, I tried all the meal plans. In the early years of motherhood especially, I heard all of this buzz about meal planning. The way that I had done it up to that point, it was just go to the grocery store and buy a bunch of things that seemed like they looked good. Then when I got home, because of the way that I had taught myself to cook this experimental method of cooking, I just decided that I would look in the fridge every night and kind of throw things together. That it seemed really normal to me because that was the way that I had learned to do things. At some point. Maybe around the time I had the revelation about cookbooks actually being instructions for creating specific types of meals. I decided that we were going to learn how to use cookbooks. Dave and I printed out a calendar and we decided the meals for the month. Each week I included one to two recipes, specific recipes from some of my favorite cookbooks. I have a couple very favorite cookbooks. One of them is How to Cook Everything. One of them is Smitten Kitchen. Those are the ones that come directly to mind. So for a number of months we would do a monthly meal plan and then I went through the process of going through my cookbooks and choosing a recipe and then creating a shopping list that included all of the ingredients for all of the different dinners I had planned, plus the things we might need for lunches and breakfasts. That worked well for a while and then it kind of was a lot and I remember when my one of my son stopped napping, I don’t remember which one. And then the evenings got a little trickier because he was kind of grumpy in the evening but we still needed to eat and Dave was in school and didn’t get home until. So I was doing dinner and feeding the kids by myself before he got home and all of the sudden making an elaborate meal from a cookbook seemed very silly because I was the only one there to eat it with my little kids eating, you know, they’re kind of kid, kid versions of it. So I decided that we needed to scale back even differently. We started doing a more simplified version where we did themed meals and this is really popular. Maybe you know about this: Choosing like Italian food on Mondays, Mexican food on Tuesdays, breakfast for dinner on Thursdays and just going with a theme for each night of the week. That also worked really well for a while where we had the theme. Then there were just what seemed like a finite number of options within each theme and I still did all of the writing out of all everything that we needed and going to the grocery store and getting all these specific things. And I still had this feeling that I wanted to switch it up a little bit. I wanted it to be fun. I wanted to add variety. I wanted to be exciting and different and I wanted to enjoy the process of cooking it as well, which is something that I loved. Meal planning is a lot of work. Now after my third baby was born, I just absolutely hit a wall with meals. I didn’t enjoy cooking anymore because I couldn’t even be present in the process. Everything felt like it was a lot of work. Coming up with ideas for recipes was a lot of work. Writing down all of the different ideas for meals was a lot of work. Putting together grocery shopping lists was a lot of work going to the grocery store and looking for sometimes random things that I didn’t buy very often with a lot of work, trying to even make something like macaroni and cheese with one baby in my arms and one opening every drawer in the kitchen, taking every single thing out of all the covers and putting on the floor… (You moms of toddlers know what I’m talking about.) …and then the other one, you know, tugging on my shirt, crying, needing something. Having my third baby really rocked the boat. My life went from feeling semi-organized, never perfect, into feeling like a three ring circus all the time. I was doing lots of things to simplify. This is when I implemented the capsule wardrobe. This is when I quit my job for six months and I quit blogging for the year. All of a lot of the things that were just normal to me were not working anymore. I needed to stop and evaluate and decide what actually worked for my family in the stage we were in right now. What came to me when I did that, thinking about our meals was this rather than a themed weeknight meal, I needed a meal for each weeknight. Period. I didn’t want to do Italian night on Mondays, I wanted to do spaghetti and eatballs with a green salad from a bag. I didn’t want to do Mexican night on Tuesdays I wanted to do breakfast tacos with guacamole. I was able to simplify so much that my meal plan all of the sudden looked as easy as seven meals for seven days repeated over and over and over again. We in America especially think of variety as really a normal part of life. If you think of different cultures around the world and the types of cuisine that they create, most likely what will come to mind are very cultural specific types of meals. When I lived for five months in Costa Rica in my college years, I ate Gallo Pinto, which is a fried rice and black beans with lizano salsa every single day. When Dave and I lived in Puerto Rico, soon after we got married, we ate some form of plantains every single day. Whether it was tostones or mofongo, plantains were on the plate every single day. During the 18 months that I lived in Buenos Aires, Argentina. I eat empanadas all the time. I think the three meals that we eat the most in Argentina were empanadas, pizza and pasta, just regular spaghetti with spaghetti sauce and some sort of beef short ribs or something on top. I guess I can’t mention Argentina without talking about meat too, like just tons of meat on the parilla. We ate essentially the same meals over and over and over again. But when you live in America, you are going to eat Italian food on Mondays and Mexican food on Tuesdays and breakfast for dinner on Wednesdays and Asian food on Thursdays and we just come up with these ideas for exciting and overcomplicating the way that we eat. What is the purpose of food? When you consider the primary purpose of food is as fuel for our bodies, the way that we get nutrients and fiber and carbohydrates and calories and minerals and all of those things that our body needs for survival. That is the primary purpose for food and it can happen a lot of different ways. There are of secondary purposes for food and I think those are important as well. Food builds cultures and it creates relationships. Food can inspire emotions. I think that maybe sometimes there’s some dangers that can happen with tying your emotions too closely, closely to food, but we know that it happens. I mean, we all do that in some form. 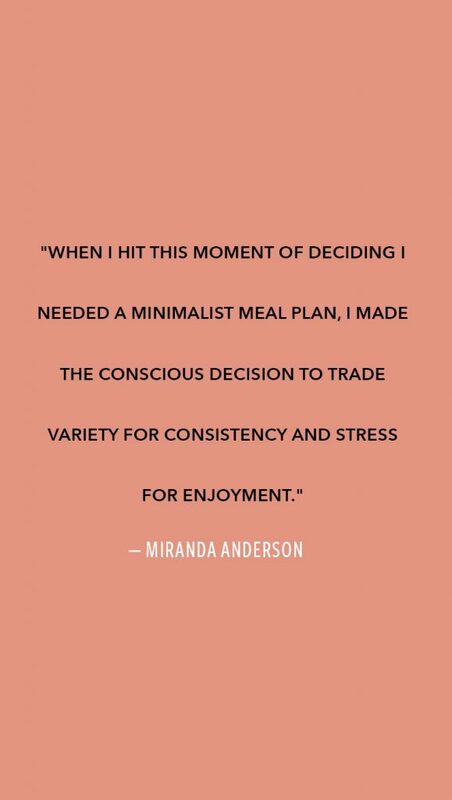 When I hit this moment of deciding I needed a minimalist meal plan, I made the conscious decision to trade my variety for consistency. I was going to trade my stress for enjoyment and I was going to trade all of those impulsive last minute “I have no idea what I’m doing for dinner, so we’re just going to drive through chick-fil-a for the 10th time this month.” into simple healthy meals that were easy to prepare for me and my family. The benefits of the minimal meal plan were numerous. One, I always knew exactly what was for dinner. If I knew what day of the week it was– which, you know, sometimes we’re not exactly sure what day of the week it is– but if I could look at a calendar and see that it was Tuesday, I knew exactly what I was making for dinner that night. Not only that, it also greatly simplified my grocery shopping list because I bought the same groceries almost every single week. There were a little bit of variations in breakfast foods or you know, things that took longer to run out of. So I didn’t have to replace some things every single week. For the most part. My basic grocery shopping list was not just similar. It was the same for weeks on end. That had the unexpected fabulous consequence of keeping our grocery budget very, very consistent. In fact, over the years that we did our minimalist meal plan, our grocery budget was so much lower than it had been because of all of the random fluctuations depending on the ingredients that I was using in years past. So it was really, really beneficial. On top of that, the other benefits of doing a meal plan this way where that the meals that we chose, we involve the kids in choosing and so they would eat them. I knew that they were going to eat them. We had decided we were going to eat them, so I wasn’t making a big meal. Just haven’t, you know, crossing my fingers that people would enjoy it. They were also all 30 minutes or less meals so that I could start and finish and have food on the table and get the kids ready for bed all easily, even if Dave was not yet home for work. The final super unexpected consequence was that my kids loved it. I had no idea how much they would love the consistency of knowing themselves what was for dinner every night of the week. I’m going to tell you how to do this in just a second and in the meantime you can print off this FREE MINIMAL MEAL PLAN PRINTABLE WORKSHEET. You will be guided through the process of creating your own family specific minimal meal plan. Everyone loves a minimal meal plan! And I thought, why was I kicking myself trying to figure out how to create this exciting, varied, elaborate meal plan when all that my five year old really wants is a plate of spaghetti and meatballs? My realization that simple can be better depending on the circumstance and as long as we were choosing meals that had some nutritional value and that was beneficial. You guys, every single one of us is going to have different ideas about what the right nutrition for our family and our kids looks like. Maybe you are a meat-less family. Maybe you’re an only-plant-based family and you have a fully vegan lifestyle. Maybe you your kids don’t eat vegetables at all and you have to sneak them in every once in a while or just give them supplements there. This is a no judgment minimal meal plan zone. You can create whatever meals your family loves and that you feel good about. 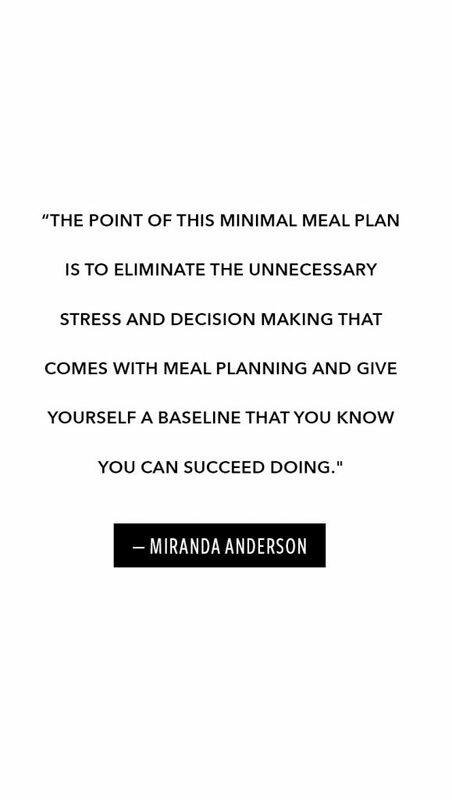 The point of this plan is to eliminate the unnecessary stress and decision making that comes with meal planning and give yourself a baseline that you know you can succeed doing. I want to walk you through the process of how I suggest to create a minimal meal plan for your family. What you choose to do with it after you create one is up to you, but if you think that you could benefit from less stress, from more consistency, from less impulse, fast food eating and from some more healthy, easy options in your everyday life, then I think that you should give it a try. Give it a try for just a couple months and see what you think and make adjustments as necessary for your family. But I think if you try it, you will find that you like it. The first thing that you want to do as you’re planning your minimum meal plan for your family is to print off the meal planning worksheet. Page one is going to give you a space for brainstorming. I suggest that everyone who is going to eat the meals in your family be included in the brainstorming phase. A couple of weeks ago I gave my kids a piece of paper and I let them do all of the brainstorming work. At the beginning I said, here, you guys write down all of the meals that you love, that you can think about that you remember eating recently, that you really like. Just write down everything you could. My two boys, nine-years-old and seven-years-old, filled the page with all of the meals that they loved. The next part of that was Dave and I taking that and immediately we could cross them off the list. We were not going to have Lucky Charms with bananas for dinner, so no judgment if that goes into your meal plan, but that was not going to be one of ours. We could immediately cross off some meals that just were not going to make it on the list and also enhance or add some things that were beneficial. I personally love a meal to include some form of carbohydrate, a whole grain if possible, but sometimes it’s going to be a potato or a roll. I like a meal to include some form of protein and it can be an animal protein, fish protein, or it can be a lagoon protein, plant protein. I also love a meal to include some sort of fresh produce, fruits and vegetables. Greenery. Leafy greens are great. I feel like that is a very, very simple outline for a basic meal. When I was teaching nutrition as a nurse, we talked about the plate method and this is something that we use the United States uses a lot where half of the plate should be vegetables, raw or cooked kind of leafy Greens. A quarter of your plate should be some form of carbohydrate and a quarter of your plate, some form of lean protein. As a general guideline, that is the way that I try to plan our meals to include those elements that is accomplished in so many different ways. So we looked at the plan and some of the things that our kids were excited about eating and when years ago when we did this, our meals were different than they are now because my kids have grown up a little bit. The things that they love eating all the time have changed a little bit. So we did the brainstorming phase. We got all the meals down on the page and then Dave and I went through an enhanced a little bit of them. Choose your seven favorites. Mostly the work for us was figuring out what types of vegetables are fresh produce we wanted to add to the meals because the kids had already written things down that included like hamburgers. So they want it, you know, they had the the protein and the carbohydrate and we need to bulk it up with a salad and some sweet potato, French fries in the oven after the brainstorming phase. And this looks so unique and individual for each family. Then you turn over onto the calendar page. So this gives you the days of the week for your family and your calendar. I want you to look at what is actually existing in the activities of your life. Consider do you have piano lessons on Tuesdays at 7:00? Well, maybe you want Tuesday nights to be a little bit more simple. Do you have a consistent place that you have to be? Maybe your, maybe if you’re a modern American family, one of your meals a week is usually eaten in the car because you’re driving to dance lessons or your picking kids up from a tutoring program. Whatever your life looks like. When you look at your week, you will have a vibe for what type of meal would work, including both the preparation, what it includes, two, like how fast you can get it ready. Some of our meals I can get ready in 10 minutes or less because of the simple because of the simple nature of them and I love that. So look at your week and look at your meals and you at this point should have chosen seven meals and then you just plug them into where they work. By way of example, I want to share our families minimal meal plan. I’m calling this version 2.0 because we had an original version that we started doing back in 2014 and used for a long time. When we moved to Richmond we got a little bit thrown off. We lived in a rental. We did Hello Fresh. We did lots of Chick-fil-a and I mentioned in my Episode 2.0 about my year in review that I wanted to get back to having more healthy, regular meals. So I thought about what had worked and I thought this worked so well for so long. There’s no reason that it shouldn’t work again. So we’re doing version 2.0. Our Monday meal is soup with a sandwich and slash or a salad. Our baseline is tomato soup. I love the organic tomato soup from Trader Joe’s and we do a whole grain cheddar, grilled cheese sandwich, and then a green salad as well. So my kids don’t often eat the green salad. I invite them to do a couple bites and I want them to eat it if they will, but the green salad that I’m using is just a bag, cabbage and cherries, green salad from Trader Joe’s as well. That meal is literally a five minute meal. It takes so little time and everyone enjoys it. Our Tuesday meal is fish tacos, grilled tilapia from the frozen section at Trader Joe’s, and a cabbage slaw. That is really easy to make. I use one a recipe from Smitten Kitchen that now I know it so well. I just do it by heart. And then corn and flour tortillas. My kids love flour tortillas. I love corn tortillas, so I’m using those. And then we’re doing guacamole as well. Our Wednesday meal is burgers and fries. I don’t love doing red meat every, like all, all, all the time at home. So this is one that our baseline meal is going to be with lean ground beef and those really yummy soft Hawaiian rolls and then baked sweet potato fries and a green salad. And I also know that this one from time to time I may switch up for a salmon burger or for a veggie burger just to keep a more plants in our diet. But my very baseline, the meal as it’s written is a ground beef hamburger with toppings. My kids put all different stuff on them. And then sweet potato french fries, and a green salad. Again, I just used the bagged salad from Trader Joe’s to keep my life very simple. Thursday night is a powerful. So this is a rice or farro bowl with roasted vegetables and feta cheese and some tazkiki and I like to put greens on top of it. Just like fresh greens from the box, like organic spring greens. And then it’s just so good. I shared the recipe for this one that we’ve been using in instagram stories a while back, but I will link it again or share the recipe again. Friday is our pizza night and Friday has been pizza night for 10 over 10 years at our house. I love it so much. Friday night pizza night was the original minimum meal plan night and so I remember thinking, Gosh, we do Friday pizza every single week and no one gets sick of it. So I mean, I don’t know who could ever get sick of pizza. I would eat it for every meal all the time, but Friday pizza night and we do that a lot of different ways. Right now we’re doing some homemade pizza and Dave and I are doing cauliflower crust because we’re in the middle of a nutrition reset and so we’re not doing the refined flour right now. I also think that it’s great to order pizza or to get taken bake pizza. So we do pizza all different ways and I have actually just never felt stressed out about the pizza because I can just, I mean last resort I can just go to Little Caesar’s and grab one for $5. Saturday night is date night for Dave and me. We choose a new restaurant to go to every week and it’s one of our favorite parts of the week. This is when we get to explore and we get to try things out and then things that we love we can take the kids back to later. Saturday night at home is mac and cheese with steamed vegetables for my kids and they have never yet complained about mac and cheese. In fact, mac and cheese is what Plum would eat every single meal if she had her options. So Mac and cheese with, you know, usually peas and broccoli kind of get stirred into it and then cut up apples or grapes on the side. Sunday night we chose two meals because we were on the fence and so we decided to just go with two and we’ll switch back and forth. One of them is a Greek salmon salad that I’ve been making for years and years inspired by the Oasis Cafe in Salt Lake City. It’s a green salad that has grilled salmon, roasted yukon potatoes, grilled tomatoes, hummus taziki, pepperoncini, olives, feta cheese. It is just like this Greek, Mediterranean delight and I love it so much and so that is one of our Sunday meals. The other Sunday meal is shrimp and grits with roasted vegetables and that is a new favorite for my kids. When we moved to Richmond, we started making shrimp and grits. It is a very cultural southern food and my kids love it and it’s easy to make and with the roasted vegetables and we’ve got the carbohydrates in the corn ground, and then the shrimp. Everyone is happy. You Choose What Works For You! So those are our family’s minimal meals for right now. You might listen to that list and think, wow, I would not want to be one of your children because I don’t like any of that food. And that’s okay. The beauty of the minimal meal plan and the beauty of just being a person and living your life is: You get to choose. These are the seven meals that are consistently on our calendar. I know exactly what to buy for groceries every single week because I can quickly go through and think what our seven meals are now. Add variety when you need it or have extra energy. This is the part that is a little bit fun. If you feel like you crave variety in your life, the minimal meal plan at the very, very least is a wonderful baseline for your meals so you never have to ask the question, “what are we going to eat?” Even if you like doing extra plans and you like switching it up, it’s a really great idea to have a baseline for your family so that on the weeks or the days that you feel not up to doing the work of the whole meal plan, that this is the one you just fall back on. This is the one that your family has decided we liked these meals, were okay with these meals. We’re going to go with this this week. It gives you an option that is not just eating out or ordering in. It gives you an option that includes simple, healthy, thoughtful, intentional meals that you’ve decided to create. If you get to the grocery store and you’re feeling super energized one week and you think, “You know, instead of the soup and sandwiches tonight, I’m going to do a beef bourguignon. I have hours in my day to cook.” Then go for it! You go mama! You can expand. This is like giving you the least common denominator for your meals. This is the very baseline and if you have this, you print it out, you work through it with your family, you hang it inside the cupboard or stick it up on the fridge. Then you always have a plan. You’re not left on those nights thinking, I have zero idea and I feel so stressed out and so frustrated, so I’m really curious to see what you think. It allows you more time because you’re not thinking consistently about what to get. At the grocery store, what to plan for your meals, where that recipe went, you get to reclaim some of that energy that you would use doing this a different way. You might be in a phase of your life that you have all of the time in the world to create meal plans and to try new recipes and that brings you a lot of joy and that is so fun. I look forward to the time in my life that I get to do that. For now, this brings such relief. It brings such peace knowing that I’ve already made these decisions and so I can use my energy and my time to make different maybe more important ones. This is the first step to getting ready to sit down with your family, fill out your brainstorming session, and then go through and fill out your days of the week, decide on these meals, and just enjoy all of the empowerment that you get from making that decision right now. Now I invite you to try it out. 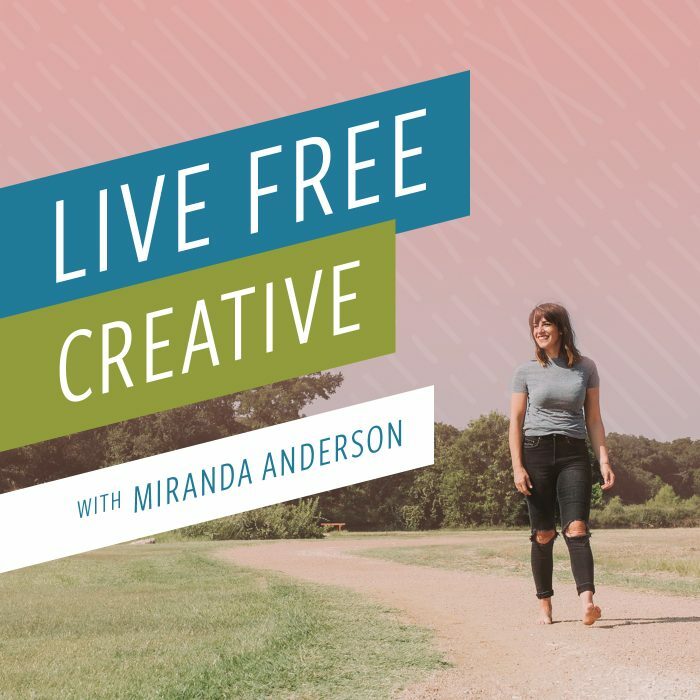 Even if you’re skeptical about this and you’re like, I don’t know, Miranda, I’m not really sure about it. I think you should give it a try. Create the meal plan and give it at least two weeks, I think at least a month, but at the very least, give it two weeks. Let yourself go through the motion of knowing exactly what’s happening and see how that feels for you. Our meal plan, one point, oh, the very beginning one, I will link the blog post where I talked about that all those years ago and that shares my specific meals that we chose back then. We did that minimal meal plan for almost three years and we felt successful and excited about it the entire time, so if you have any doubts, I think that you should experiment and challenge yourself to give it a try and see what you think. I can’t wait to see what you’re here. Thank you so much for listening. If you get a chance to share this episode with someone who you think would enjoy it, I would love that, and if you haven’t yet left a rating and slash or a review over at apple, I would be thrilled for you to hop over and do that right now. While this episode is fresh in your mind, you guys are the best. I love the show and I’m so happy to share it with you every week. I will talk to you next time.